Yesterday, we were told that we could order any breakfast or lunch dishes during brunch hours. You can view Primal Santa Cruz's menus on their website here. 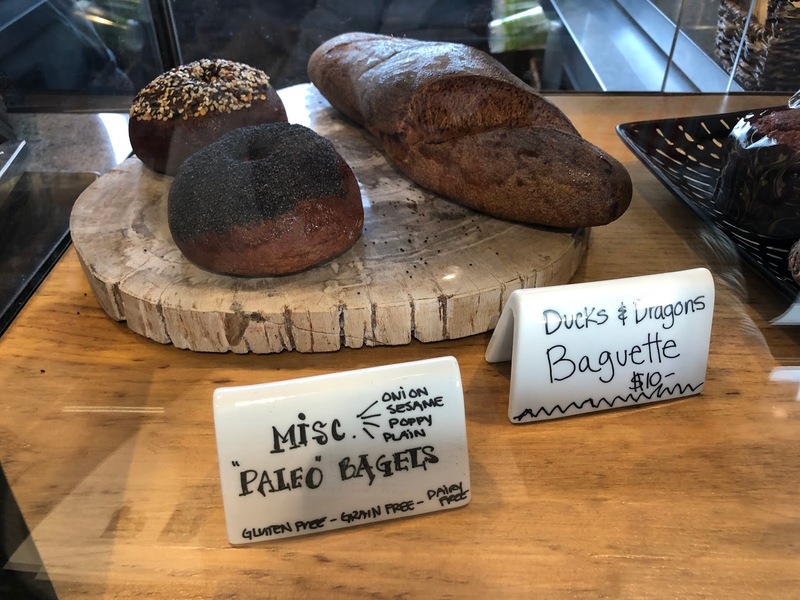 Primal Santa Cruz uses Ducks & Dragons bread, and sells some of their baked goods at the counter. Ducks & Dragons is a local gluten and flour free bakery. 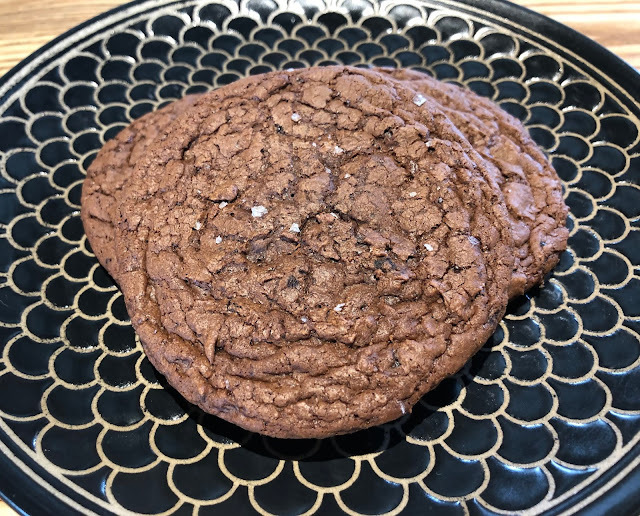 My daughters love their gluten free chocolate buns, and I am a huge fan of their salted mocha cookies. 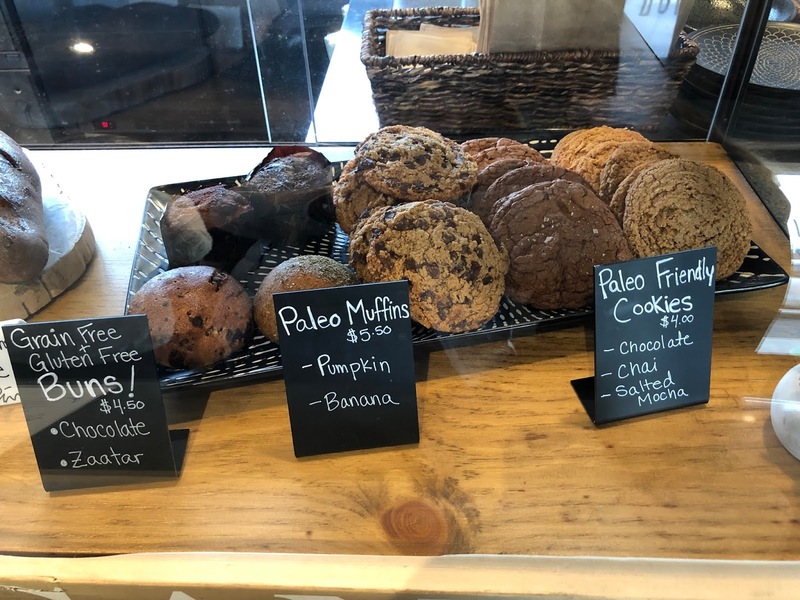 Their Paleo banana muffins are also really good. We have dined at Primal Santa Cruz six times since they opened right before Christmas, and it has become my favorite local restaurant. Thankfully, my family loves it too. 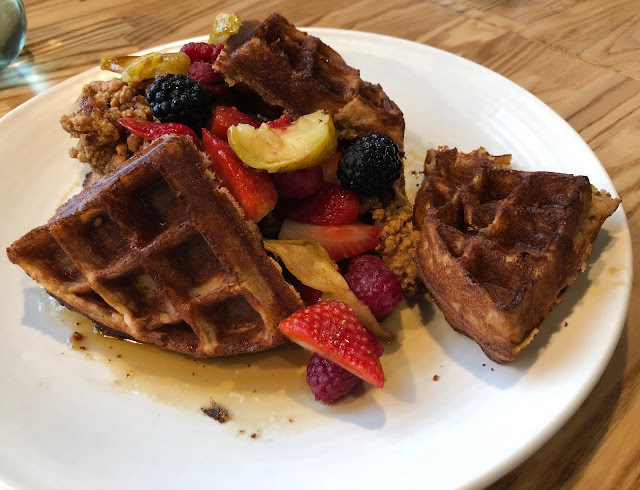 Our favorite breakfast and brunch dishes are the vaca frita, breakfast tacos, and chicken & waffles. 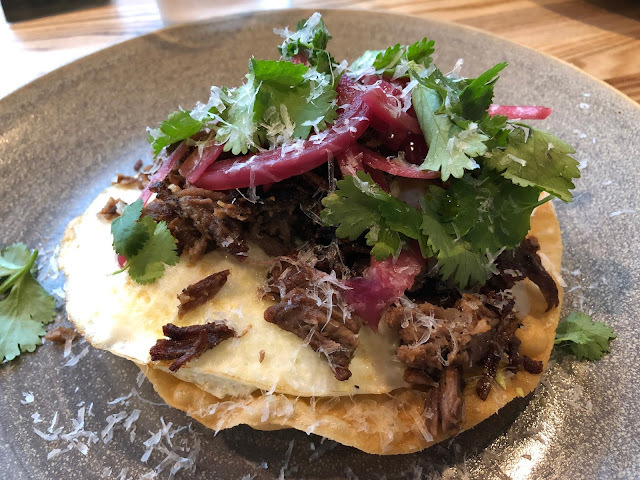 The vaca frita features a crispy Paleo tortilla with organic grass-fed steak, avocado, pickled onions, and pasture eggs. I could eat this entree for breakfast, lunch, or dinner. The combination of flavors and textures is sheer perfection, and it is a dish my whole family loves. 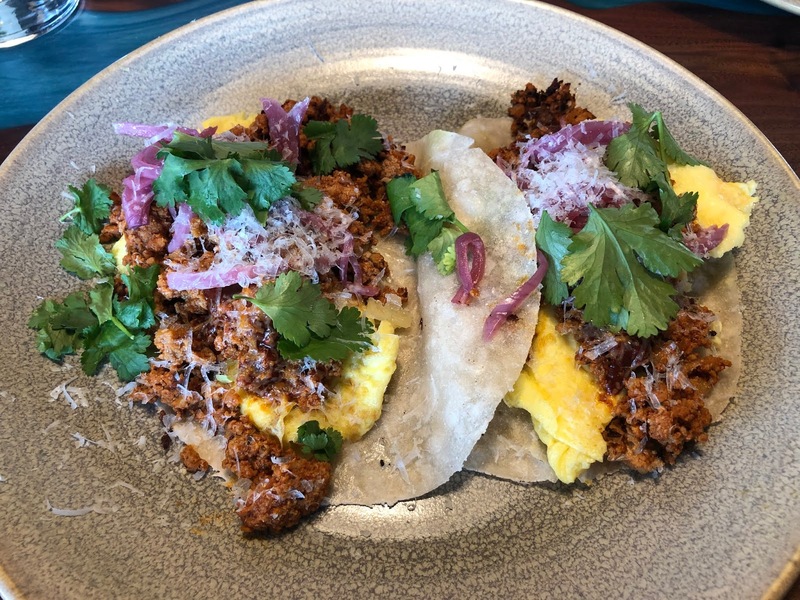 This weekend, my husband and I ordered the breakfast tacos with Siete Paleo tortillas, turkey chorizo, pickled onion, and pasture eggs for the first time. We could not decide whether we liked this dish or the vaca frita best, because they are both so amazing. We have also tried the avocado toast with Ducks & Dragons Paleo baguette, tomato, and pasture eggs on previous visits. This dish is very good, but now that we have other favorites, I don't think we will be ordering it too often. 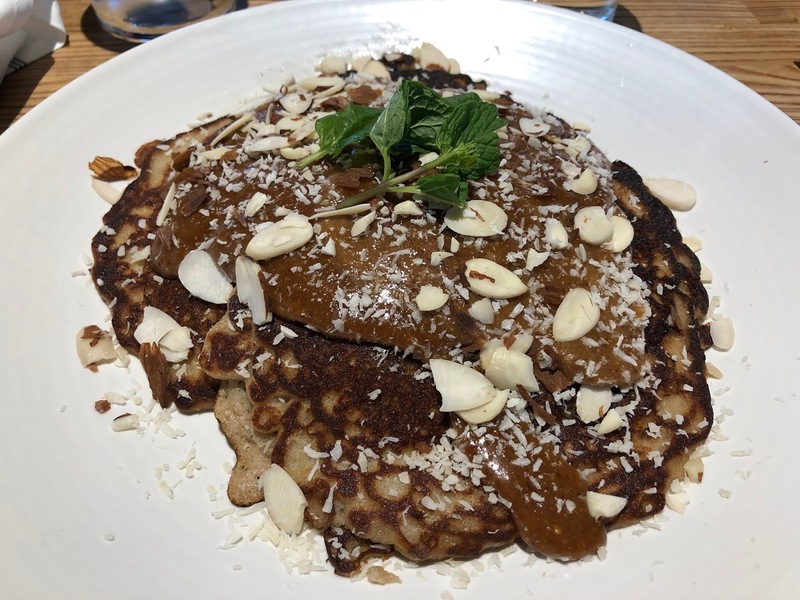 The first time we stopped at Primal Santa Cruz for breakfast, I ordered the monkey pancakes with honey almond butter, almonds, and banana. I just saw a picture of this dish on Instagram, and it had huge slices of banana on top, which mine did not have. Overall, I did not enjoy this dish enough to order it again. The pancakes were good, but the topping was overwhelming to me, because there was just too much of it. I would probably enjoy these pancakes topped with fruit, with the honey almond butter on the side. 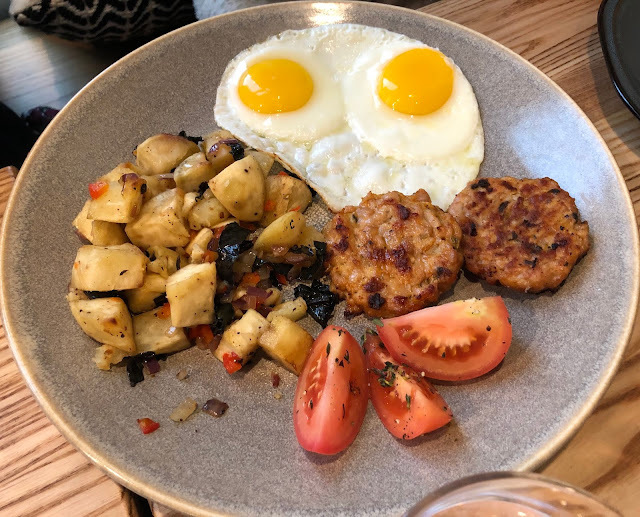 Our first two visits for breakfast, my daughters shared The Classic with two pasture eggs (you choose how they are cooked), sweet potato hash, and organic chicken sausage or uncured bacon. 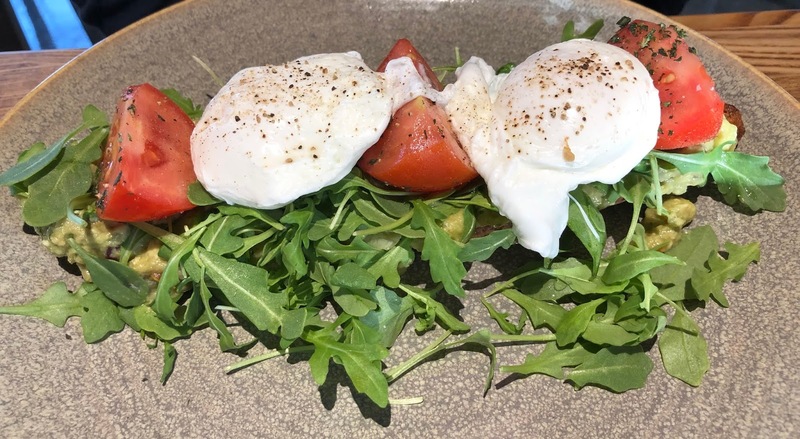 They enjoyed this dish, and were happy that the hash was made with white sweet potatoes. 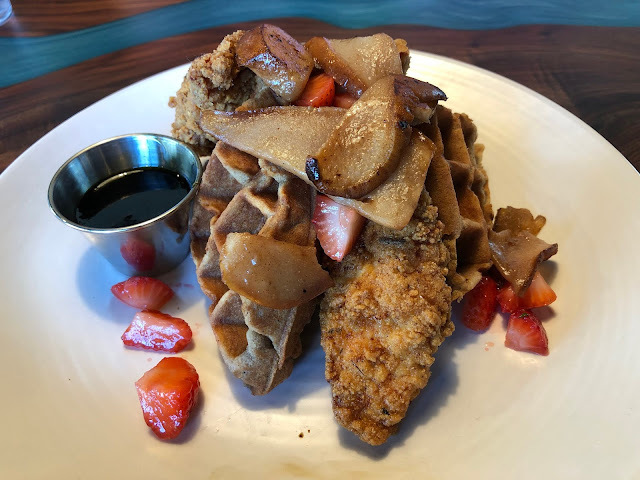 One of our favorite dishes at Primal Santa Cruz is their chicken & waffles with crispy chicken breast, seasonal fresh fruit, and honey cinnamon syrup. 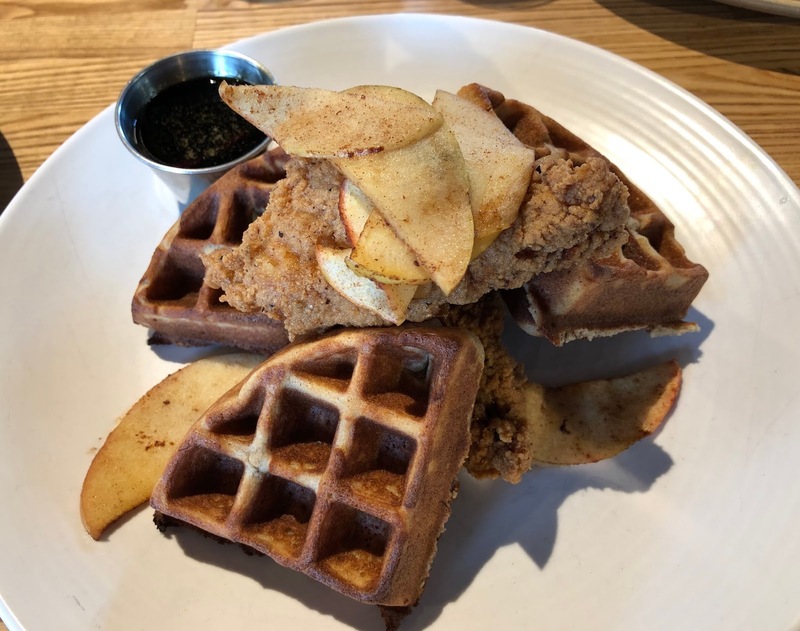 The first time I tried the chicken & waffles, I did not enjoy the waffles, because the syrup had been poured on top of them, and they tasted like coconut. 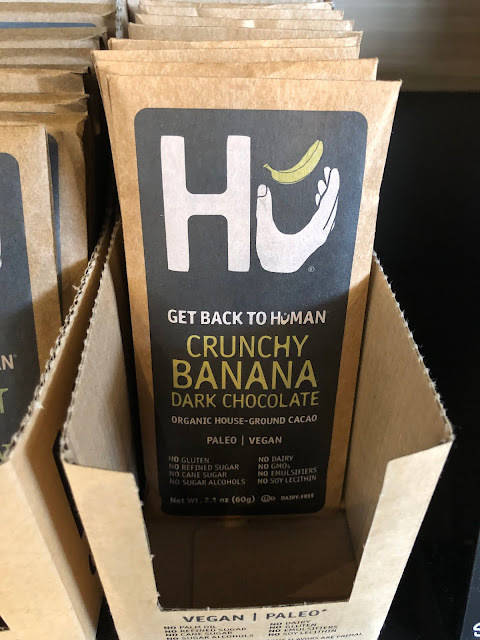 I am wondering if they changed the recipe, because the coconut taste is gone. I like to order my syrup on the side, and I enjoy eating my waffles with fresh fruit. 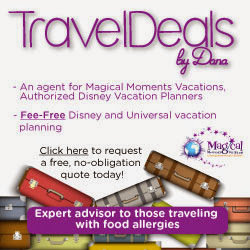 I prefer them with berries, but they are also good with apples and a little bit of syrup. 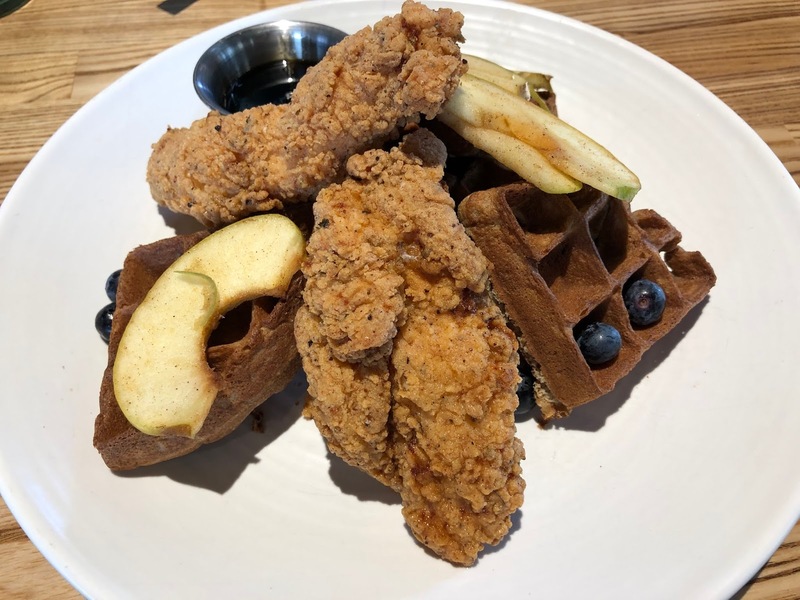 The chicken served with the chicken & waffles is incredible. 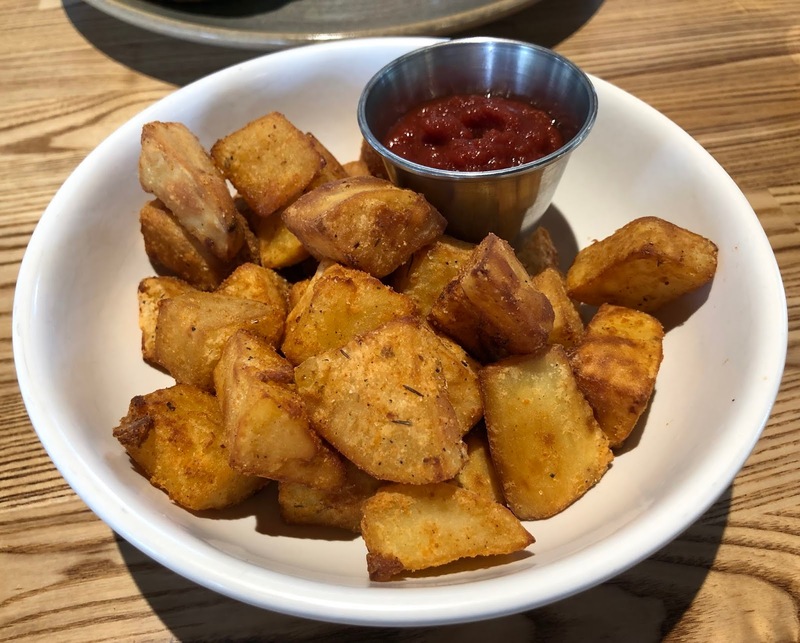 The breading is crispy and nicely seasoned, and they are so delicious eaten with a little bit of syrup and a bite of waffle. Primal Santa Cruz serves this dish for breakfast, lunch, brunch, and dinner. 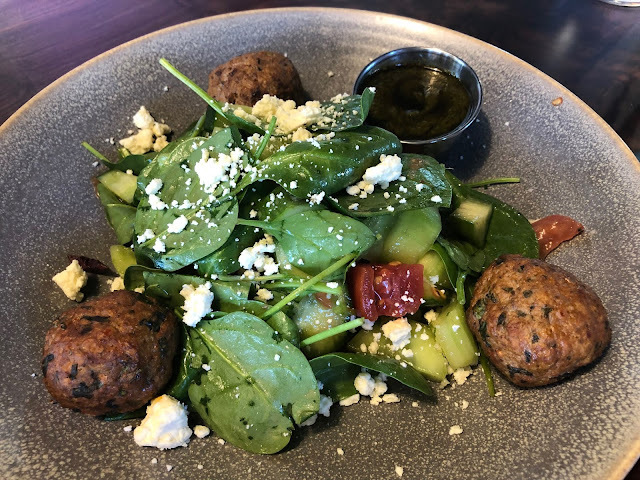 On a visit for lunch, my daughters ordered the The Hero bowl with lamb meatballs. The bowl comes with cauliflower tabbouleh, cauliflower hummus, tomato, raw feta, and green charmoula. 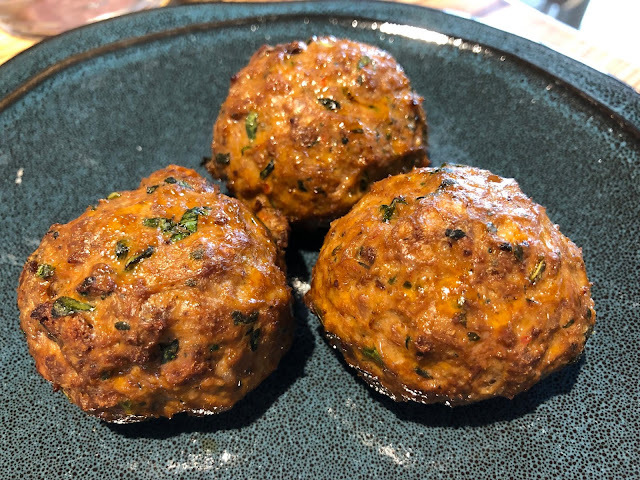 I was not surprised that they were not huge fans of this dish, but they did like the lamb meatballs, which they have ordered as a side other times we have stopped in. I wish I had tasted it, because it looked really good. 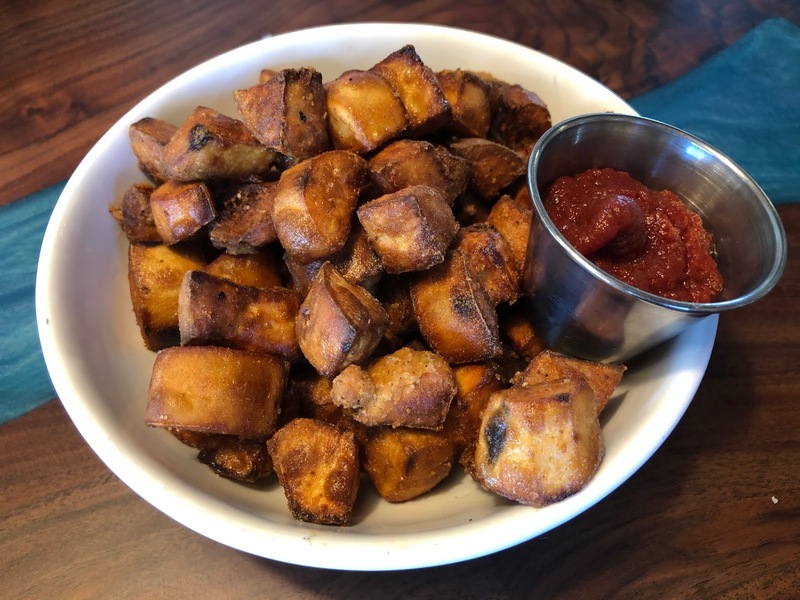 My girls love to order a side of sweet potato fries with housemade ketchup on every visit. They do not look like traditional fries, but my daughters love them, and always ask for an extra side of ketchup. My husband liked the grilled fish tacos he had for brunch a few weeks ago. 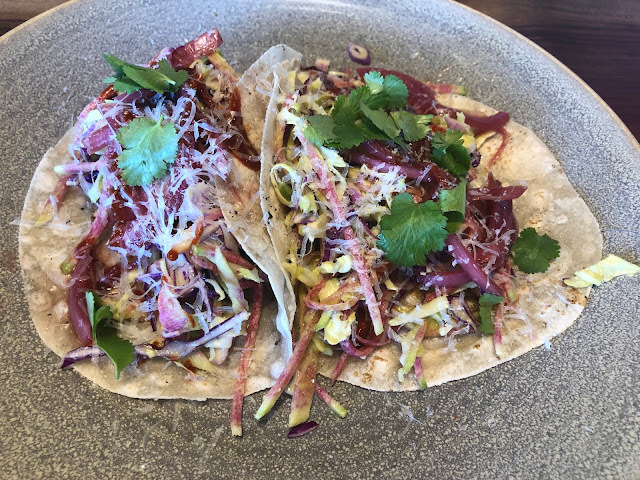 They are served on Sieta grain-free tortillas, and are topped with raw manchego and cilanto-mango lime slaw. We have also tried the Cave Kid's Burger with sweet potato fries from the kids menu. 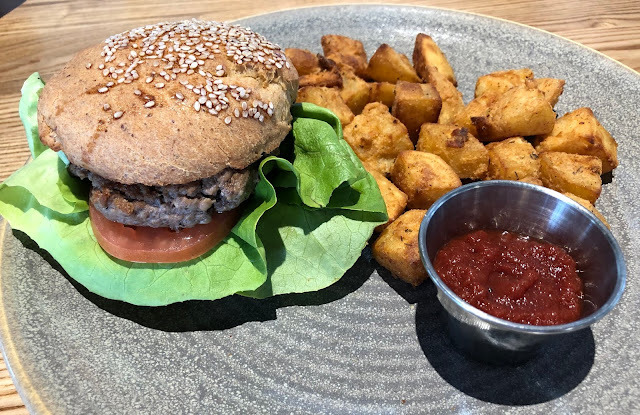 The bun was just okay, and the burger was cooked a little more than we wanted, but the meat tasted good, and the sweet potato fries disappeared quickly. I would love to see Primal Santa Cruz offer the chicken tenders from the chicken & waffles on the kids menu. When we stop in at lunch, I can never resist ordering a Ducks & Dragons salted mocha cookie. They have such a rich chocolate taste, and I love the salt on top. Last week, we had dinner at Primal Santa Cruz for the first time. We rarely eat dinner out on a school night, but our daughters had a late volleyball game near the restaurant, and the traffic was too bad for us to get home easily. 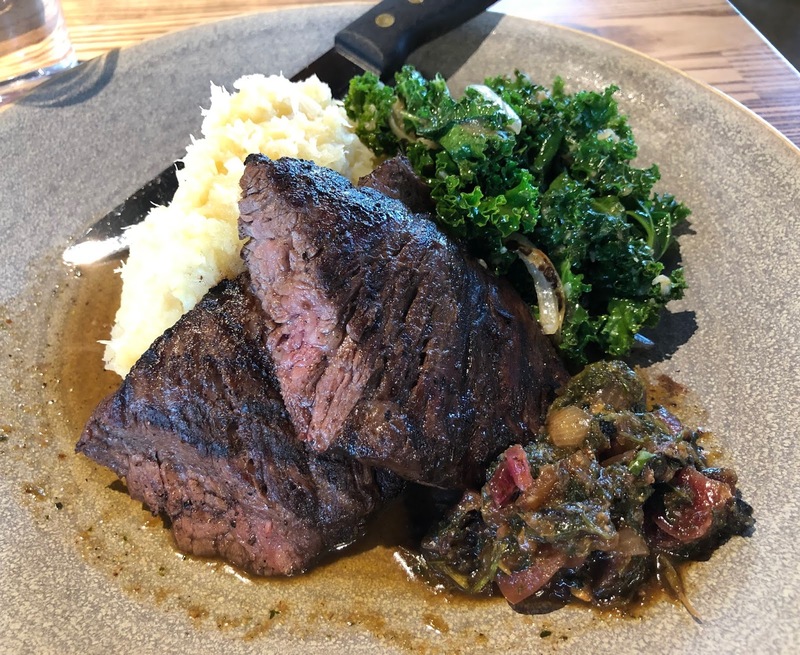 My husband and I shared the grass-fed grilled skirt steak with charred onion chimichurri, garlic kale, and bone broth mashed parsnip. We both really enjoyed the steak with the chimichurri, but for how much I love parsnip fries, I was not a huge fan of the parsnip mash, because the taste of the parsnip was a little too strong for me. My husband enjoyed it though, especially because he gave up eating potatoes a few months ago. We also shared chicken & waffles, and I ordered a side of charred broccolini with tomato jam and citrus zest. 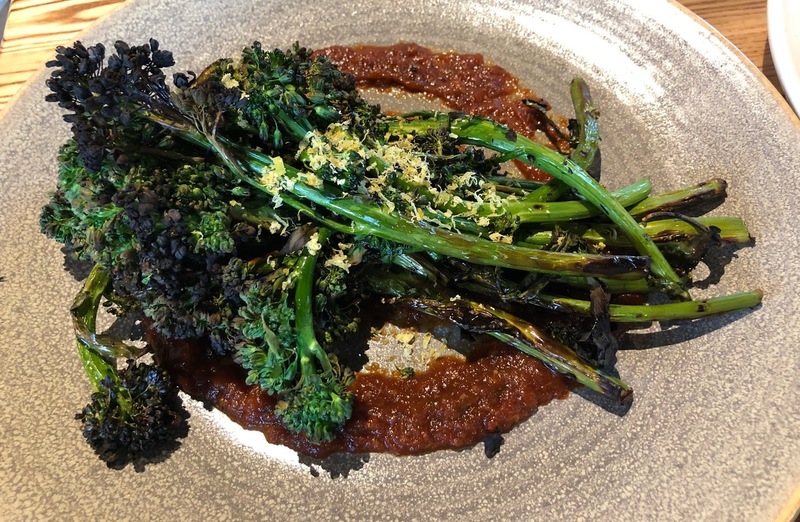 I loved the chicken & waffles, but my favorite dish on this visit was the amazing charred broccolini. I have always loved broccolini, so I was excited to try this plant-based side. It was charred to perfection, and the slightly sweet tomato jam was heavenly. Primal's in-house market offers healthy, and often locally-sourced beverages and snacks. I have tried Hu Kitchen's crunchy banana dark chocolate at their restaurant in New York City. 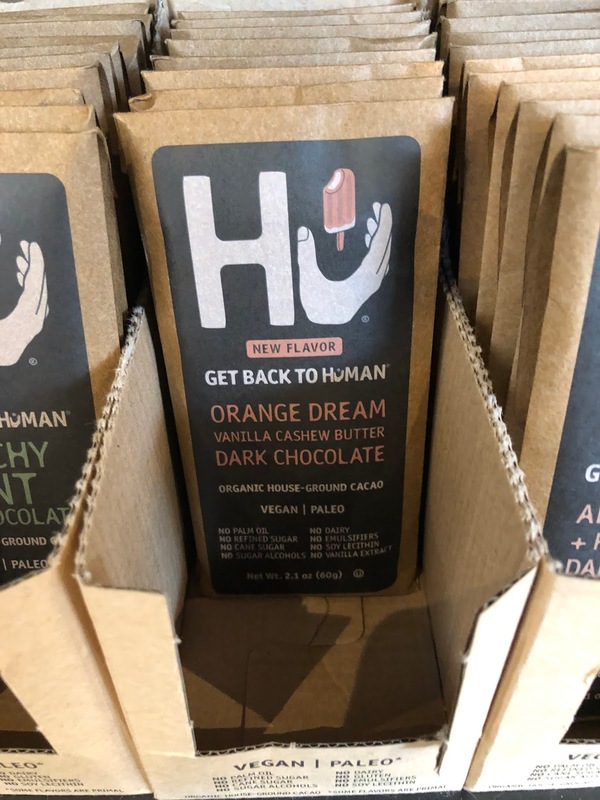 It is really good, so I am excited to try their orange dream dark chocolate bar with vanilla cashew butter on a future visit. 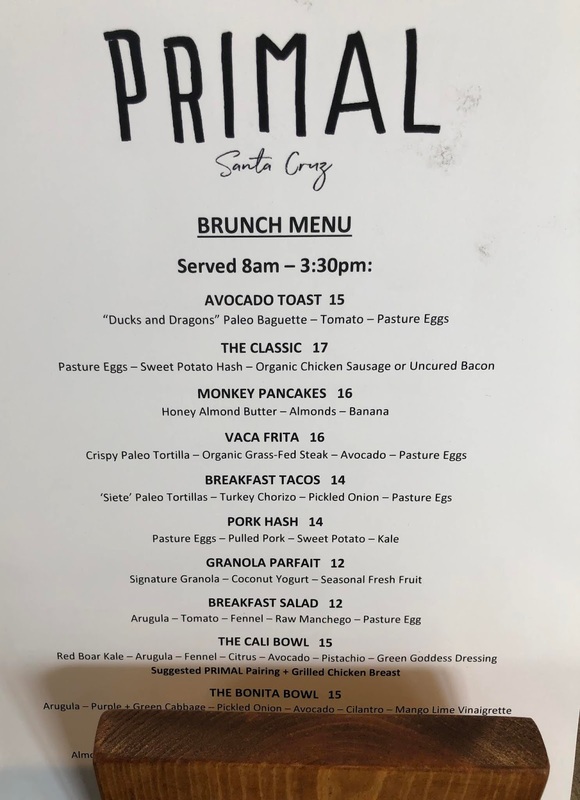 Primal Santa Cruz is not to be missed if you live in or are traveling through Santa Cruz County. 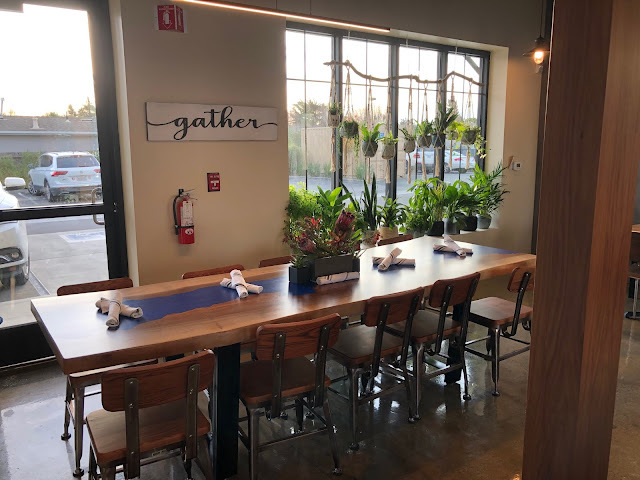 I am so happy to have a safe, 100% gluten free restaurant near our house that I can enjoy any time of the day. Within the next week or two, Primal will be introducing their smoothies, which I am excited to try. I will update my review once we sample them. What are your favorite dishes at Primal Santa Cruz?